I recall my grandmother talking about putting rusty nails beneath some of her hydrangeas to make them blue and egg shells around others to make them pink. In reality it is more difficult than this to change the colour of your hydrangeas. It is the presence of available aluminium in the soil that makes hydrangea flowers blue. Most acidic soils (pH 5.2 – 5.5) in New Zealand have freely available aluminium. In soils with a higher pH (lime or alkaline soils) the aluminium is locked up and is less available to plants. Adding aluminium sulphate will lower the pH and add aluminium to the soil. Apply little and often to avoid burning the roots of plants; 2 – 3 times through the growing season is recommended. Ensure plants are well watered prior to applying. Apply at a rate of 30g (2 Tablespoons) per square meter, and water it in. It may take a few years for the plants to accumulate enough aluminium to achieve full blue colour. Adding organic material will also help to acidify the soil (lower the pH) thereby increasing the availability of aluminium – grass clippings, leaves, fruit and vegetable peels, animal manures. This may be a slower and less reliable method than that set out above. 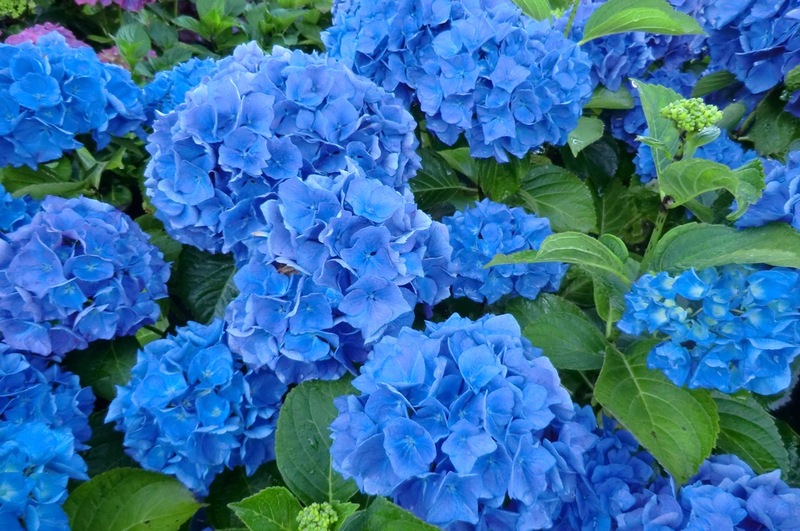 Areas of New Zealand blessed with volcanic soils have allophanic soils (allumino-silicate clays) and typically present beautiful blue hydrangeas. Note – if you want a blue hydrangea select a good blue variety such as Adria, Blue Meisse, Gentian, Renate Steiniger or Vibraye; rather than attempt to turn a pink variety blue. While some varieties will produce either a good blue or a good pink this is not always the case. I will do another post soon on achieving and maintaining pink hydrangeas. This entry was posted on 1 August 2013 by Michael Jeans. It was filed under .